Cine Basura: La Película (2016) - Sci-fi-central.com. Spain  2016  90m   Directed by: Paco Fox, Miguel Ángel Viruete. 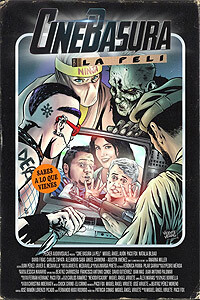  Starring: Miguel Ángel Aijón, Paco Fox, Natalia Bilbao, Agustín Jiménez, Darío Frías, Carlos Zapata, Alejandra Saba, Maite Medina, Miriam Montero, Jorge Muñoz, Cha Fernández, Carlos Palencia, Jose Manuel Sanz.  Music by: Chuck Cirino, Eli Cirino. Two geeky video bloggers are sucked into a truly awful Z movie. On their return to the real world, they discover they have been pursued by the tropes of the trashy films they adore. Directed, written and starring by the creators of Videofobia (The Spanish Cinema Snob), we have a film that tell us one of the weirdest and funniest stories on any Crowdfunding film ever made. Paco and Miguel are two vloggers that, while They're working on a video, They accidentally open a portal to another dimension: The Bad Movies Dimension. And That duo (plus to the camerawoman called Topanga) must save to the world of all the elements of the B Movies and Z Movies and discovered how close the portal. Continuous jokes (not just made on the screenplay, also the elements that appears), nice acting, well-made directing... It's hard to explain, but you must watch it for understand it. It's an experience for everyone who loves that type of cinema and its tributes. You can buy it on Amazon with English Subtitles. Review by aara-31592 from the Internet Movie Database.